CD Genomics has further optimized the process to exceed PacBio’s benchmarks in output and read length to support long-read metagenomic sequencing, and reduce some splicing errors and effectively improve the resolution of microbial community profiling. Metagenomics is defined as the direct genetic analysis of genomes contained within an environmental sample. The field initially started with the cloning of environmental DNA, followed by functional expression screening, and was then quickly complemented by sequencing of environmental DNA. Microbial samples are from nearly everywhere. Examples include microenvironments within and on the human body in healthy and diseased states, soil samples, plant roots, marine environments, wastewater treatment plants, urban areas, and so on. In metagenomic experiments, total genomic DNA isolated from the environment are sequenced. It allows the researcher to identify the genes possessed and the metabolic processes performed by those microbial communities including unculturable organisms in the environment. While many natural microorganisms cannot be isolated and cultured or cloned, some microbial biodiversity has been missed in sample preparation and sequencing. 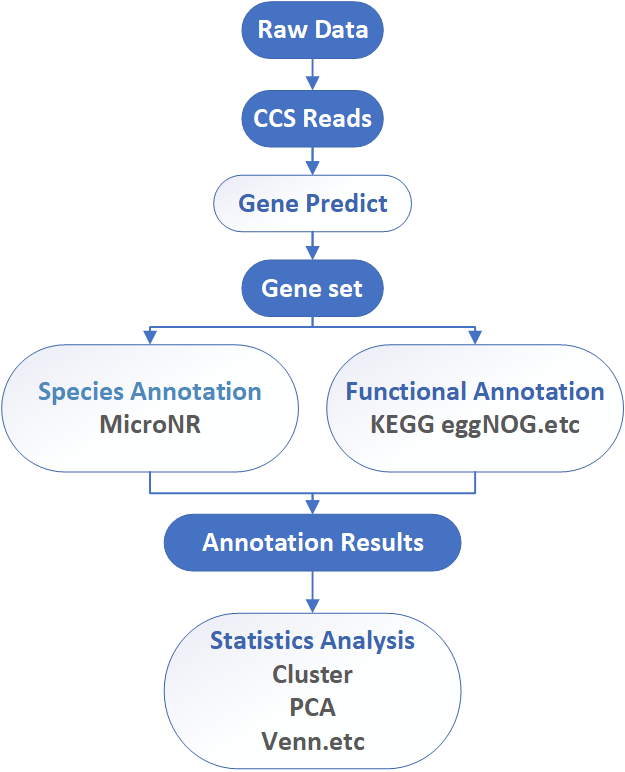 Now, CD Genomics provides long-read metagenomics sequencing service on PacBio SMRT System in a culture-free method, which could sequence thousands of organisms in parallel, and reduce some splicing errors and effectively improve the resolution of microbial community identification.Long-read metagenomics sequencing also help researches generating new insights into the function and pathway facets of the microbiome, trying to understand and elucidate the relations between microbes and its habitat/host. The data analysis is based on the highest quality single-molecule CCS reads with no need of assembly for species-level classification, functional insight and pathway enrichment study, could restore the information of microbial community in the environment. Long-read metagenomics sequencing is a powerful way to obtain microbial genomes with the highest accuracy and reliability. Longest average read lengths, with~50% of reads longer than 50kb, which exceeds the size of repetitive elements in the average bacterial genome. Functional annotation: KEGG, eggNOG, CAZy. PacBio System is highly robust and cost-effective and should be the platform of choice in metagenomics sequencing , particularly for complex sample and low-diversity microbial communities. CD Genomics will be your best companion in long-read metagenomic sequencing. Please contact us for more information and a detailed quote.